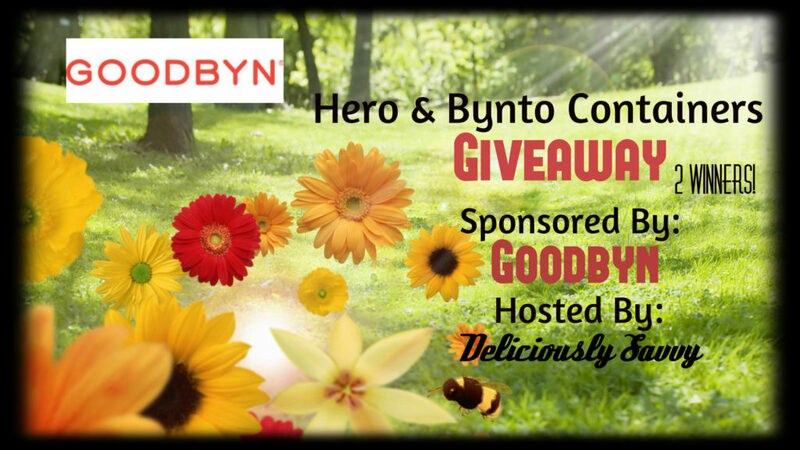 Deliciously Savvy is Hosting another Giveaway in which 2 Lucky Winners will each receive a GOODBYN Hero container & a GOODBYN Bynto Container in their choice of colors! These are perfect for packing healthy and delicious snacks and lunches…. take them to the pool, beach, camping, hiking, for school lunches….or for anything! Total RV $44! Enter Today & Good Luck! I really love the expandable lunch kit. I just wish it came in all the colors. I already have the pink snack bin and a few green little dippers and love how bright they are. I would really like the purple Hero, and have more of the green (Bynto). I actually have the snacks and little dipper containers and love them. Peanut butter in the dipper and crackers and apple slices in the snack are fantastic on the go. I really like the purple and the green. The small meal sets also look really useful. Another item that I like is the Goodbyn Expandable Lunch Kit, it is cute and looks practical. I would choose the containers in red. I would like to see hot pink Bynto containers! There are so many lovely and popular colors to select from but Hot Pink would be my favorite. Another item I like is the Green Bynto Bottle. I would choose the Red Hero and the Green Bynto containers.